With summer just round the corner, residents and visitors are being urged to discover the medieval history of Bristol thanks to the publication of a new walking tour map of the Old City. 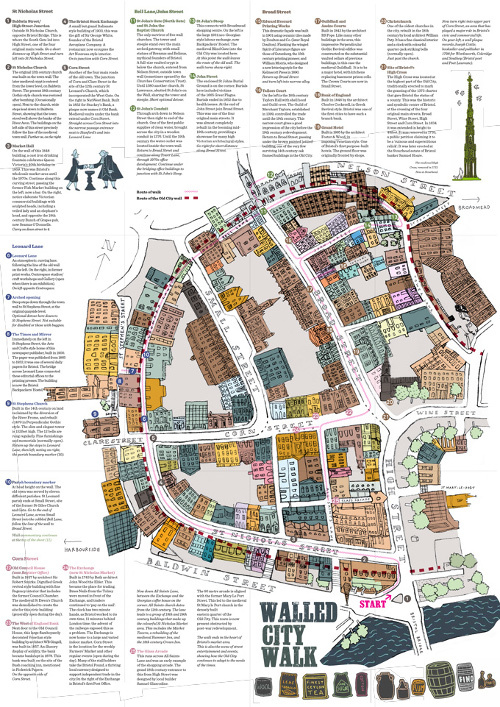 The Walled City Walk map follows the town walls of Norman Bristol. With the walls no longer visible, their route is little understood or used, and the rich architectural heritage of the Old City often goes unnoticed. The guide explains the history of the area and its buildings and outlines those aspects of the social, religious and business life of the city that have influenced the last 900 years of its development. Designers based at the Centrespace gallery on the tiny Leonard Lane in the Old City worked alongside the Bristol Civic Society and St Stephen’s Church to produce the guide, described by Bristol history expert Professor Peter Fleming from the University of the West of England as “an imaginative and exciting way of bringing History into the daily lives of people working in and visiting the oldest part of the fascinating city of Bristol”. The walking guide and postcards will be available at the Tourist Information Centre, the local shops in the Old City, and online at the Bristol Old City website.